Students: Remember that your parents can complete this process. This is the parent's dashboard screen. Your name, email and phone number will appear in the My Profile section. Under My Children you will see your student's name, email and phone number. 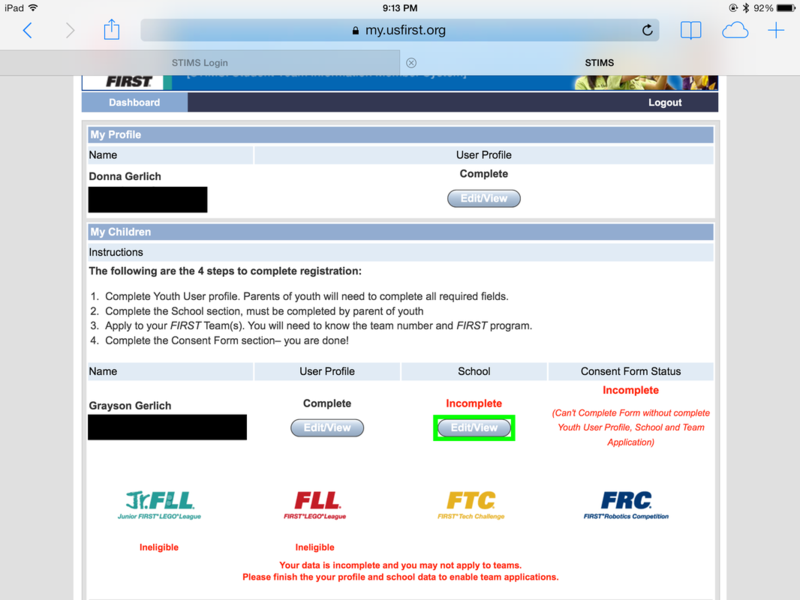 To the right is your student's user profile, which may be marked as "Complete." Regardless of whether it is marked as complete or not, you'll need to make a few changes. Click the Edit/View button under User Profile. 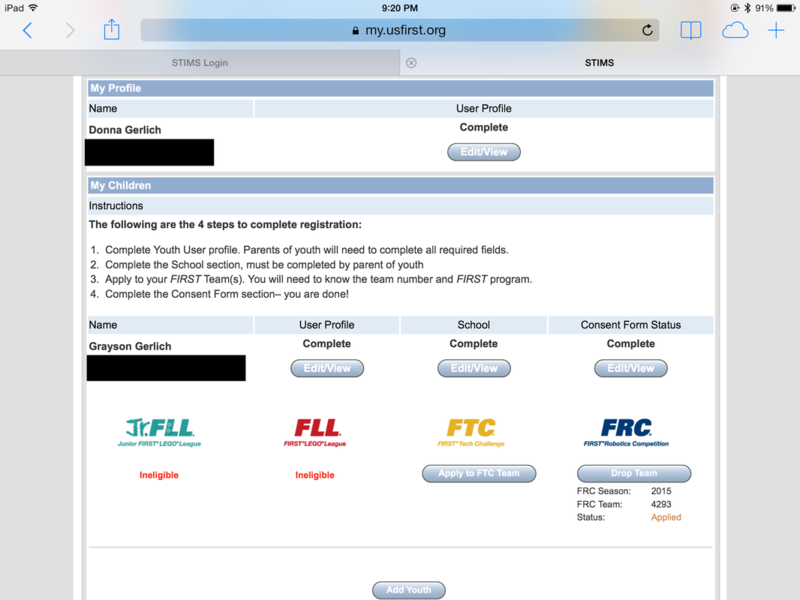 On the User Profile screen, scroll to the bottom and find the blue "FIRST Robotics Competition Program Participation" box. The previous FRC competitions that your student has participated in should already be checked (if not, check them at this time). You will need to check the "2015-2016 TBD (FRC)" box as well to indicate participation in this year's game. After doing this press the save account button. You should be returned to the parent dashboard screen. Under "School" you will see "Incomplete." Click on the highlighted Edit/View button. On this form all four questions must be answered. 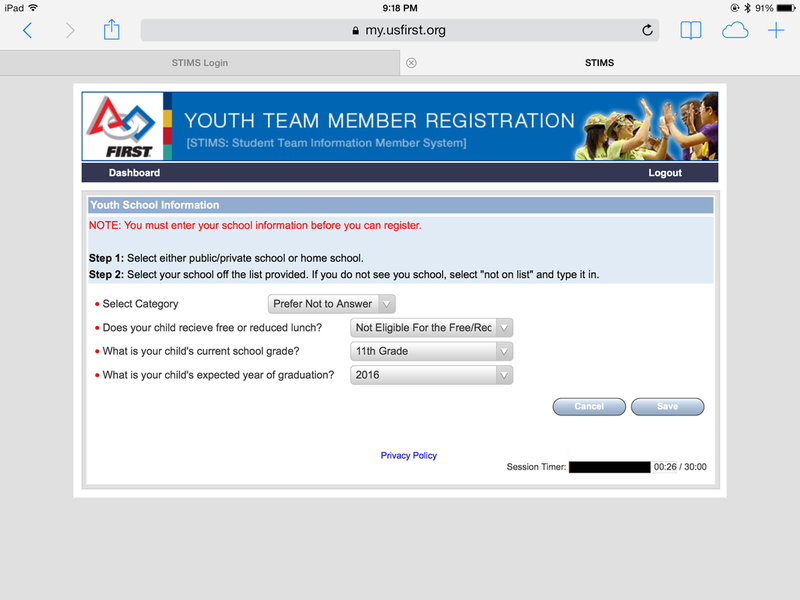 The first question will ask you to select a school. Both Douglas County Early College and Colorado Springs Early College are not included on this list, so if your child goes to either of these schools select "Not on List" and type in your school name or select "Prefer Not to Answer." The other three questions may then be answered. After completion of these, click the Save button. The previous step will return you to an updated parent dashboard page. The Consent Form column will still be marked as "Incomplete" but the School column should say "Complete." Under the Consent Form column is the FRC logo and an "Apply to FRC Team" button. Press this button. The screen you see will look like this. In the "FRC Team Number" field, please type 4293. You should see the following screen. After entering the team number, the following information should appear. If not, click away from the input box and it will appear. After inputting the team number, press the "Apply To" button. The previous step will bring you back to the parent dashboard. 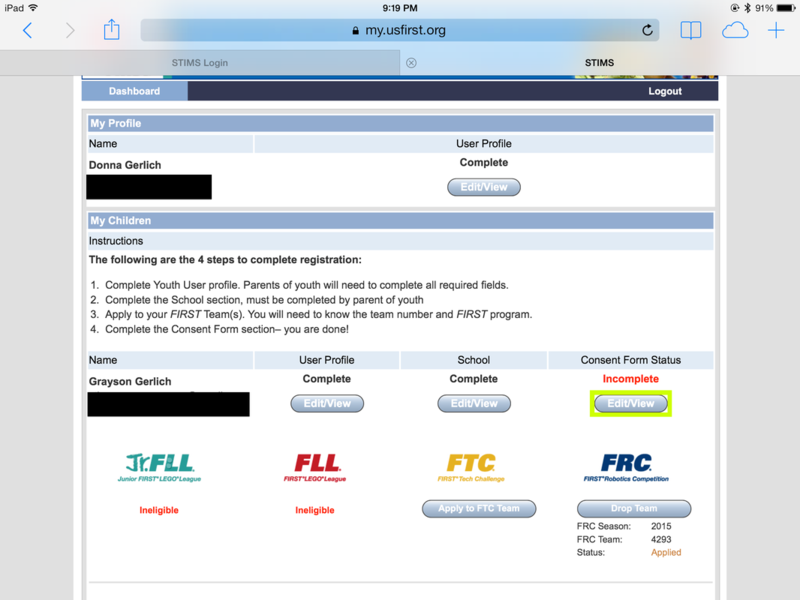 You should now see the season, FRC team and application status under the FRC logo. You should now be able to edit the consent form. Press the Edit/View button under Consent Form Status. Please read and review the consent form, then scroll to the bottom and sign, date and submit the form. 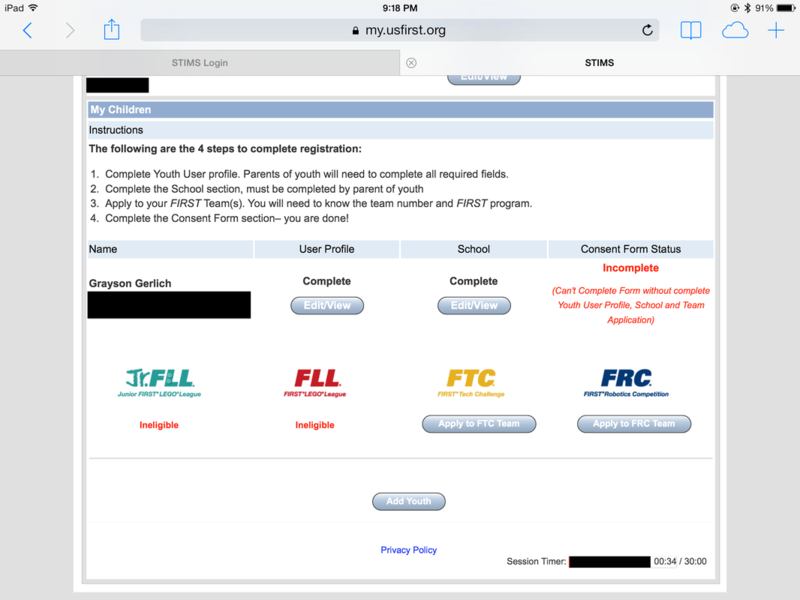 Once the consent form has been submitted, you will see the following screen with the "User Profile," "School" and "Consent Form Status" showing as complete. 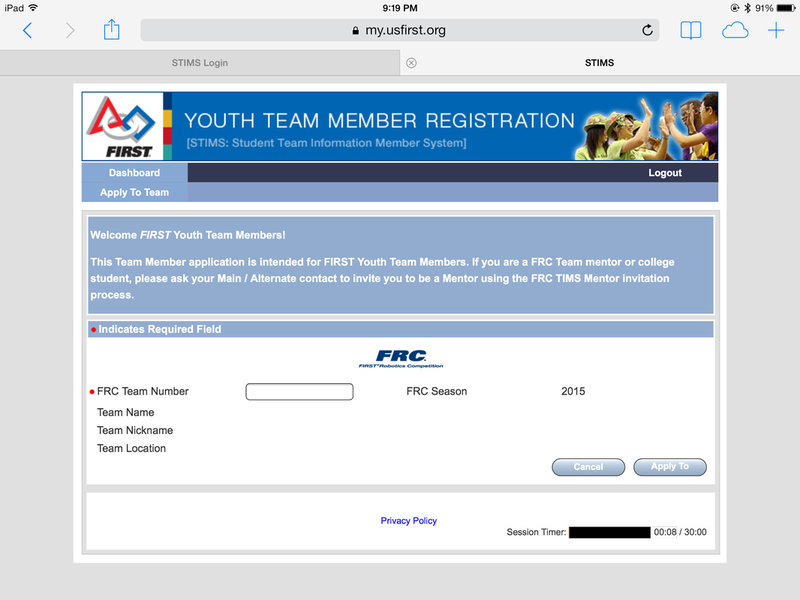 Under the FRC logo you should still see the FRC season and team number, and the status should register as "Applied." 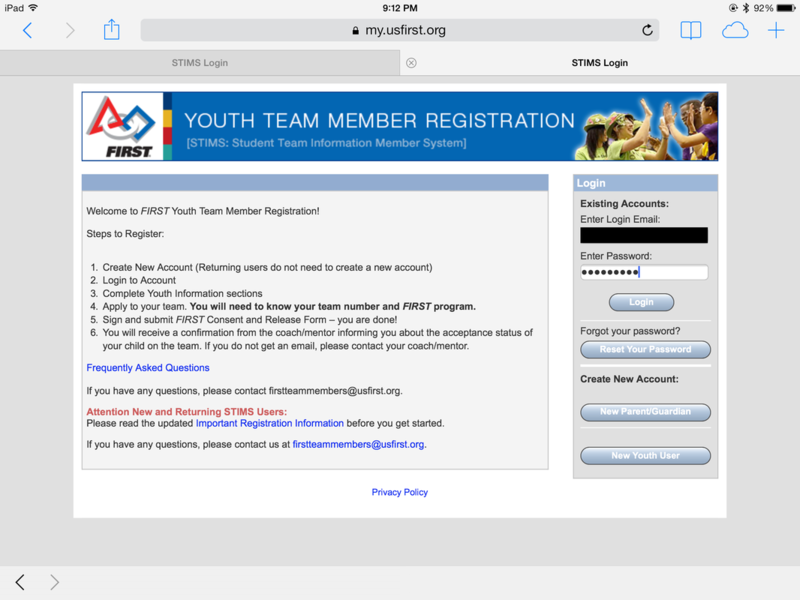 You will recieve and email at the account you signed in with from firstteammembers@usfirst.org confirming your student's registration. Finally, this year we are collecting contact and emergency information via a google form to reduce paperwork. This also makes sure that the team has contact information for every student and parent to distribute information and in case of emergency. This form also serves as our demographic form so we can get information for grants. Congratulations! Once you've completed the STIMS registration and the emergency contact form, you are successfully registered for Team Komodo for the 2019 season!